World Series favorites, the Chicago Cubs took another step in their championship chase by rallying for four runs in the ninth inning of Game 4 to beat San Francisco Giants 6-5 and win their NL Division Series. The Cubs will open the NL Championship Series at Wrigley Field this Saturday against the Dodgers or the Nationals. The Cubs trailed 5-2 heading to the ninth last night and now, they are heading back to the NLCS after snapping San Francisco’s 10-game winning streak. 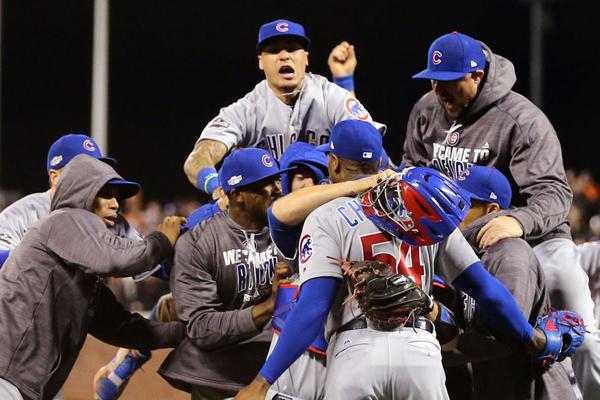 Now that they have eliminated the Giants, the Cubs are one step closer to the ultimate goal, winning the World Series, a feat they have not accomplished since 1908.